Blessed with beautiful beaches, a rugged coastline and great wine, is the dream of every European vacationer–Portugal! From architecturally striking cities to quaint little fishing villages, Portugal is a versatile country that offers great entertainment. Tourists love to drive with Hertz car rental in Portugal as it is the best way to capture the flower-carpeted hills of the spring and the coastal towns nestled in the lap of the Atlantic. 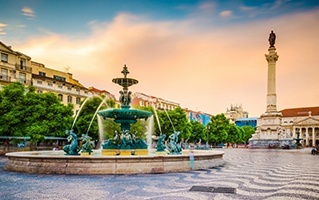 Driving around with Hertz car rental in Portugal is recommended since the city has well-engineered highways and rustic roads which offer picturesque sceneries. Take advantage of the light traffic as you drive down from Lisbon to Algarve and explore the charming streets of these cities. The Portuguese cuisine may not be too upscale but there are some traditional bucolic dishes that are definitely worth a try. You may find some true gems that serve the best and the freshest produce along this route. The capital city of Lisbon is built on seven hills and offers breathtaking views of places in and around the city. It is the cultural centre of Portugal and is great city for people of all ages. The old town of Porto looks over the River Douro and is one of UNESCO’s World Heritage Sites. The São Francisco church and the port wine are highlights of this city. Madeira in Portugal feels like it is has been picked from somewhere in the Caribbean. Its tropical weather and cosmopolitan ambience make it an apt weekend getaway. Hire a car of your choice with Hertz, pay online or during pick-up of your car and drive away in the mesmerising country of Portugal!